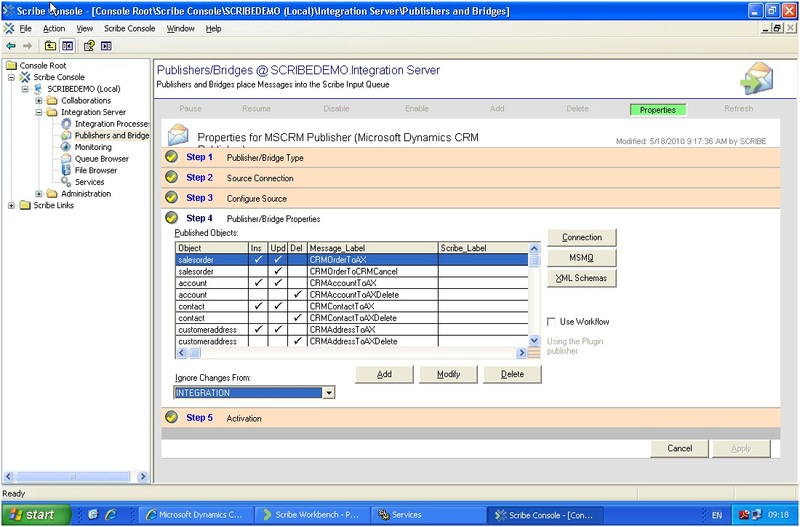 Scribe Insight provides three useful tools for migrating or integrating data between different sources or applications – each of which is described below in the context of integrating MSCRM with AX. 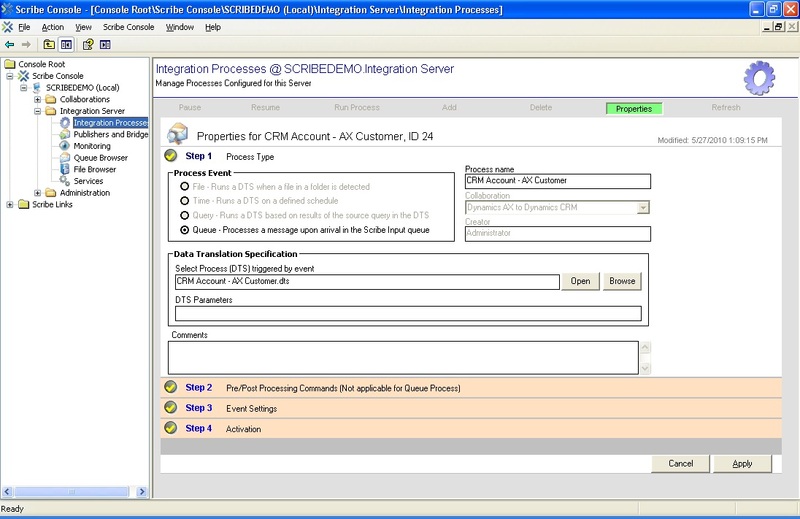 This is based on the background of using the Scribe Template for CRM and AX Integration as a base for building a bridge for integration specific to the project involved. 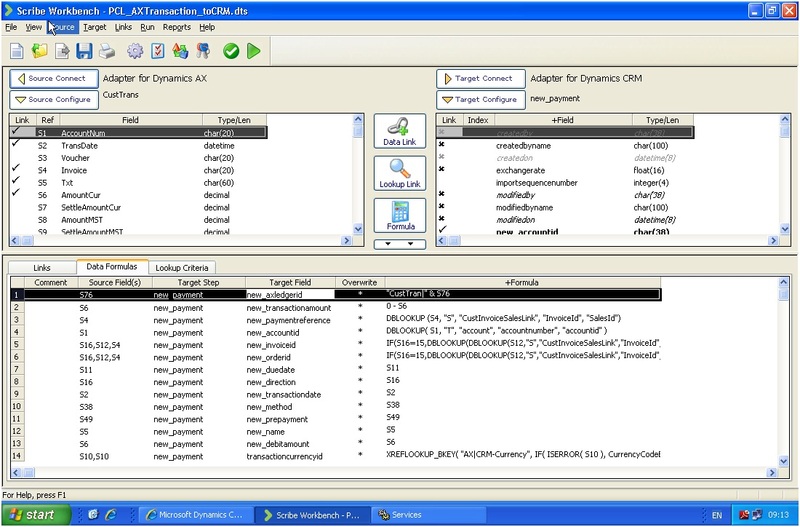 Scribe Data Translation Scripts (DTS files, not to be confused with SQL DTS Packages although similar in concept) authored via the Scribe Workbench component detailing where to migrate data from, how to translate or transform that data and then where to migrate the data to. These DTS scripts can then be run once for simple Data Migrations, or run regularly to manage batch updates (say for nightly or weekly data synchronisations) or run on event to implement transactional integration. Scribe Workbench editing a DTS Script for taking Data from one of the tables in Dynamics AX (as the Source) and into Dynamics CRM (as the Target). 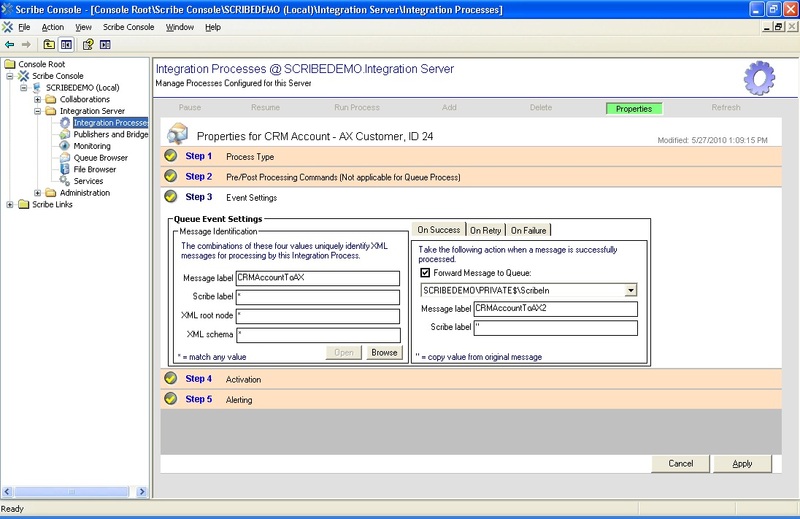 Scribe Integration Processes managed through the Scribe Console component for scheduling regular or on event execution of these DTS Scripts. 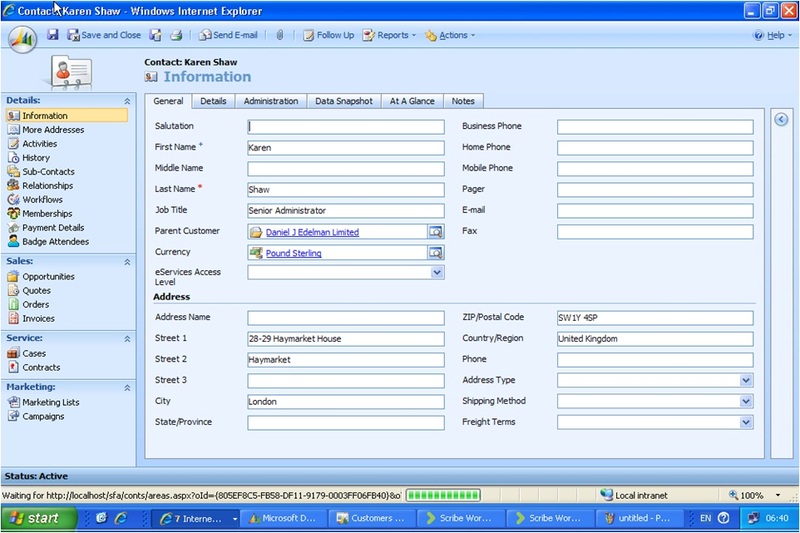 Integration Processes can implement regular migrations or integrations of data between different sources to facilitate regular transactions of data – this can often be regularly scheduled to import or integrate data at a certain time each day or week, or triggered from a certain event such as a file being uploaded to a Network/FTP location. In this case for integrating data between MSCRM and AX, the integration processes wait for a certain entry in a Queue and then translate the (source system) entry into MSCRM or AX as the destination system. 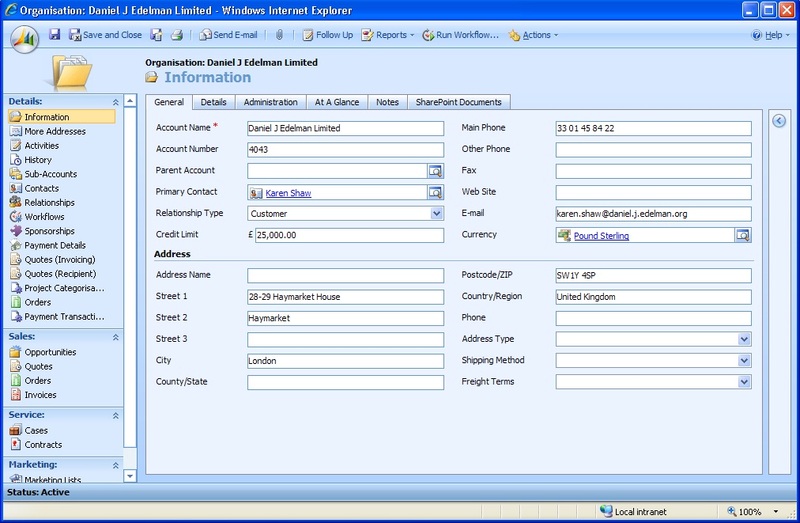 Scribe Publishers managed through the Scribe Console Component allow for the production of real-time XML Messages in response to system events – such as a Customer Account being created or a Sales Order being updated in Dynamics CRM, or a Invoice being raised in AX. 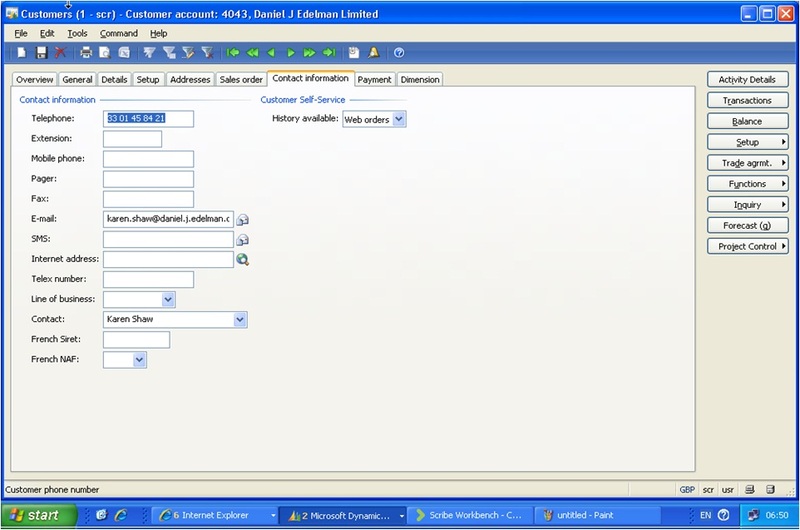 XML Messages produced by the Scribe Publishers are then queued within a Scribe Queue to be picked up by an Integration Process monitoring for a certain type of XML Message (such as the message produced for an update to a Customer Account) which can then be used as a Data Source for an DTS Script to integrate the transaction into the target system. The above describes how the Scribe Template for MSCRM-AX integrates the two applications together, the following aims to show this integration in action first-hand for Customer Accounts. Then open AX to see the same Customer in AX. 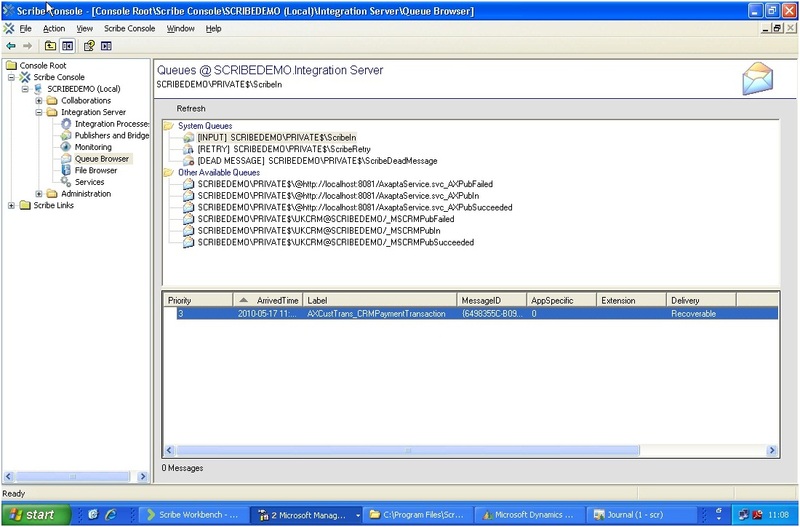 Viewing the same Account in AX, created as a result of the Post-Create event in MSCRM being captured by the Scribe Publisher and so recorded as an XML Message that is then translated via a DTS Script into AX. 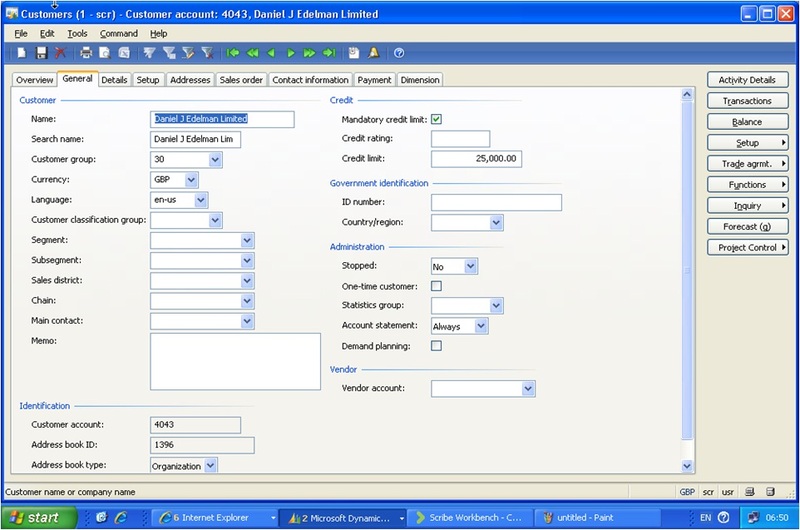 Opening the detail view of the Account in AX shows the details generated automatically by AX (such as the Account Number) alongside the details specified earlier in MSCRM. 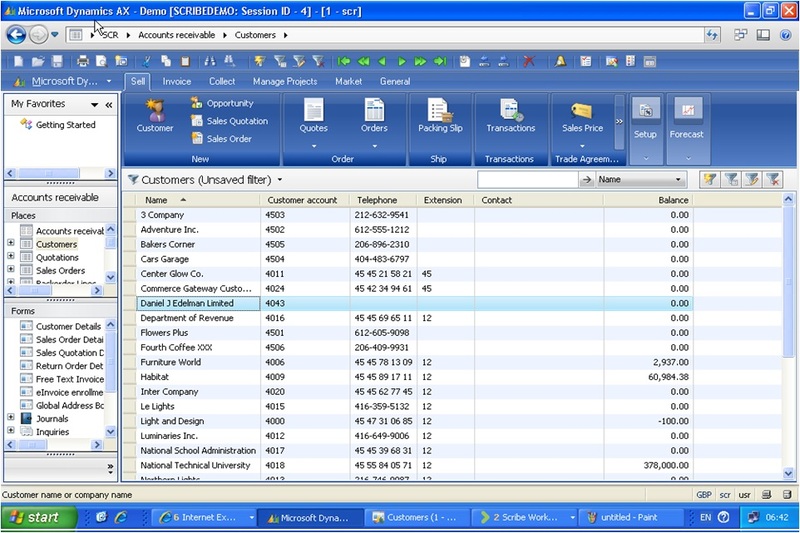 The detail view of AX also shows the Primary Contact details entered earlier in MSCRM. 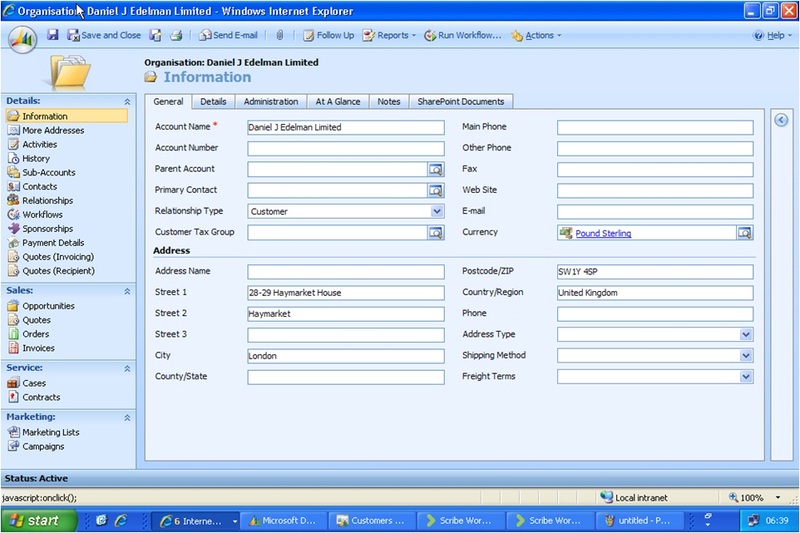 This basic set of integration between MSCRM and AX for Customers, Contacts and Addresses is included as the base in both versions of the Scribe MSCRM-AX Template. Following this overview, we can begin to investigate more process-related integration for Sales Orders and Invoices that is included in the v1.1 of the Scribe Template. Before then looking into how we can then both alter the existing DTS Scripts to modify which fields are integrated between MSCRM and AX, and also how we add new DTS/Process/Publisher arrangements to include additional entities and screens in the integration for more specific project requirements.